Yummy Mushrooms. I love them, but I have yet to hunt for them. Sounds like fun! We were just talking about morels. A girl brought a huge one into work today to show off. It was enormous! I will eat any kind of mushrooms, love them (ah, the edible kind that is)! eww, I don't like mushrooms. But at least I learned that those are mushrooms. I had no idea when I saw the picture. I love mushrooms -- never had those ones before though! Yummo! Love mushrooms! such tasty goodness! How much fun it must be to 'hunt' for your own mushrooms. Bet they taste better that way! Wow! Very interesting. I've honestly never heard of them. I would have no idea on how to "hunt for them." Hope you enjoy them. how weird... I've never seen those before! Very cool looking! Happy WW. my brother goes NUTS over these!! I've heard Morels are fabulous. I haven't tried them yet, and I'd be a bit afraid to search for my own in case I mistakenly ingested something not-so-edible. hmmm. interesting! I have never heard of them!! Enjoy them! Can't say I ever tried them, but I'll take your word for it! Happy WW! I've never eaten them, but they look very cool! Those look sooo yummy! I look forward to eating mushrooms every year. My husband's only found two small ones this year. I dont care for mushrooms though, so maybe that's why? 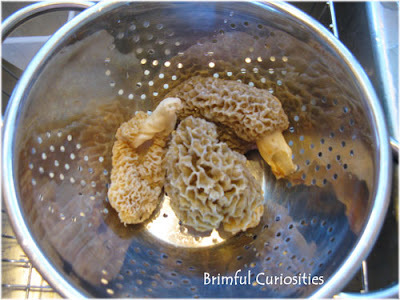 MMMM morels sound delicious! I have never heard of this recipe before but I look forward to trying it!